Just like they’ve done with every Strange Music release since the beginning, the dedicated and hardworking Strange Music Street Team squads all around the country have been busy spreading word of Stevie Stone’s Rollin’ Stone. The debut Strange Music release is creating quite the buzz as it includes the hits “Get Buck” and “808 Bendin” featuring Tech N9ne, as well as guest appearances from Yelawolf, Hopsin, Peetah Morgan, Krizz Kaliko, and more. With members of the Strange Music Street Team hitting their city streets hard, Stevie Stone recently jumped on the web to reach out to the teams personally and asked them to share their most creative and unique promo photos. As the teams continue to push Stevie Stone’s Rollin’ Stone, there is no doubt we will be seeing plenty of great photos in the days to come. Are you a Strange Music Street Team member? Share your photos with Stevie Stone on Facebook! 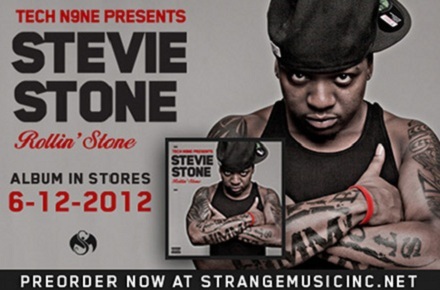 Click here to pre-order Tech N9ne Presents Stevie Stone – Rollin’ Stone. What are some of the unique ways you’ve seen people promote Strange Music?